HOW TO BOX, KEY AND WHEEL YOUR WAY TO WINNING AT THE RACES! Knowing horse racing terminology is one of the key ways to produce winners at any racetrack. Understanding "How To Bet" is half the battle for amateurs and professionals alike. What good is having a winner of a horse race and then wagering it incorrectly? We've all done this at one time or another. Why? Because horse racing has a multitude of wagering types that can easily confuse or get in the way of betting it right. Here's some basic horse racing terminology that can greatly improve your betting strategy. Another betting strategy is the Exacta box bet. You applied the horse racing system and deduced a winner. Now your important wager must yield the proper dividends at the ticket window. Exacta Box wagers may be made for as little as $1.00 up to a maximum of $250 per individual bet. To determine the cost of your Exacta Box wager, multiply the dollar amount of your individual wager by the number of bets as determined by the number of horses you wish to box. For example in a 3 horse box there are 6 bets. If the dollar amount of the individual wager is $2.00 then the cost would be $2.00 x 6 bets = $12.00. Remember that horse racing terminology applies to every person who visits the racetrack. These are simple basic wagering techniques to improve your play. If you select one horse to win and wish to "Wheel" it with the rest of the field in the place and show positions you may do so at any ticket window. If your "Wheel" horse wins the race you win the triple regardless of which horses finish second or third. See my Part-Wheeling betting strategy horse racing betting guide You may also "Wheel" a horse in the the place position with the rest of the field in the win and show positions. You may also "Wheel" a horse in the show position with the rest of the field in the win and place positions. Again these individual wagers are based on a $1.00 wager. These wager types are not secrets of handicapping but greatly help in achieving your maximum winning yield at any racetrack. It's also important to remember that some racetracks do not offer $1.00 wagers and some tracks do...it is common that the $1.00 wager usually pays half of the full $2.00 wager. WIN - Pick a horse using my Winning Methods. You're a winner if the horse that you bet on wins! PLACE - You're a winner if your horse finishes First or Second! SHOW - You're a winner if your horse finishes First, Second or Third! EXACTA - Pick the First TWO horses to finish in exact order. TRIFECTA - Pick the First THREE horses to finish in the exact order. A professional horse racing betting system is not needed to wager properly on any given horse race. However, basic wagering terms and horse racing terminology terms are needed in order in Win, Place or Show! Now that you understand horse racing terminology for Boxing horses, Keying horses and Wheeling horses you can wager properly at the ticket window. Betting the "Kentucky Derby" or the "Breeders Cup" these terms will greatly increase your winning productivity. 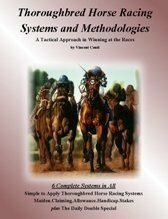 Visit my homepage Horse Racing Book and discover 6 new horse racing systems that will help you deliver that one-two punch at any racetrack, horse parlor or casino! My horse racing terminology and betting guide will direct you to the winner's circle!